The Kildare Town Heritage Centre is the ideal point of departure from which to explore the ancient treasures of the town. It is housed in the restored and refurbished nineteenth century Market House. 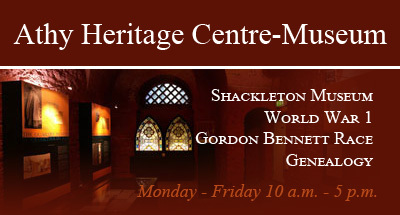 The Heritage Centre was formally opened on the 17th September 2001 by the then Minister for Finance, Mr. Charlie McCreevy. The building has a long and varied history. According to the Statutes of Henry VI (1458) a market had been held in Kildare ‘from time whereof memory runs not,’ and an official weekly market, to be held on Thursdays, was authorised by Henry VIII in the Charter of Kildare of 1515. Reference to the ‘Market Place’ can be found in the Registry of Deeds Office in 1726 and 1751 and it was designated the ‘Market Square’ in Thomas Sherrard’s Map of Kildare of 1798. John Rocque’s Map of Kildare (1757) identifies ‘The Markett house,’ in the centre of this Square on the site of the modern Heritage Centre. According to Rocque it consisted of three adjoining buildings with a yard in 1757. By 1798 (Sherrard) it had developed into a singular rectangular building with a section to the western side. This projection had disappeared by 1817 but a small northern (facing Nugent Street/Station Road) projection could be noticed on the 1838 Ordnance Survey Map of the town. According to Niall Meagher, former Co. Architect, while it may have incorporated an earlier structure, the present building dates from the nineteenth century. In 1838 the Market House was clearly identified as a public building and by the mid-nineteenth century at least it had been re-developed with an upper level. In the mid-1880’s a water tank was placed in the roof of the Market House as a receptacle for water being pumped from St. John’s Well at Tully. 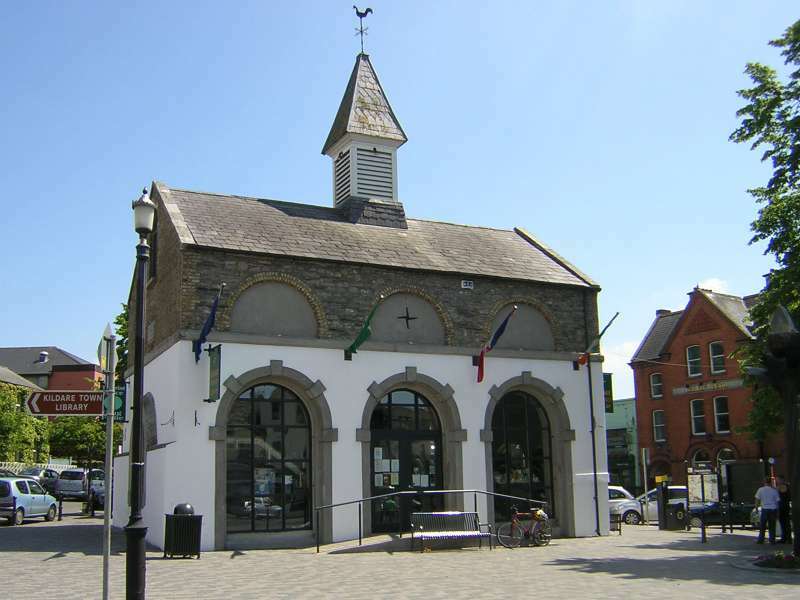 By the mid-twentieth century the Market House had fallen into disrepair and was bought for £300 by Kildare Co. Council. It was carefully reconstructed in the early 1970’s winning an An Taisce Award in 1973 and, a bus shelter, public toilets and small museum were incorporated into the new building. The cast-iron water gauge dated 1885 was retained on the outside of the building as was a plaque celebrating the completion of the Kildare Waterworks in 1886. 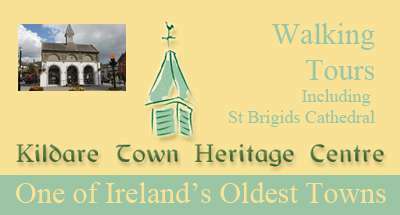 A Heritage Project Committee was formed in 1992 to campaign for Heritage Status for the Town of Kildare. The designation of Heritage Town provided an impetus for the reinvigoration of the Market House. The European Development Fund provided £230,000 towards the project with additional funding coming from Kildare County Council (£50,000) and local contributions. Once building began the reconstruction and refurbishment took a little less than 2 years and Kildare Town Heritage Centre was officially unveiled in September 2001. The Centre, which is now open six days a week, is the Tourist Office for local and county-wide tourist information, a place where tourists can book accommodation or plan their itinerary. 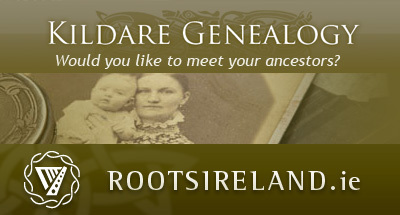 It also has a vibrant shop where visitors can purchase books, souvenirs and jewellery and is the hub for Kildare Town Historic Walking Tours – so why not visit to see what is on offer or check out the wonderful website – www.kildare.ie/kildareheritage to find out more.